Experience the novel Wife 101 firsthand with The Wife 101 Workbook. 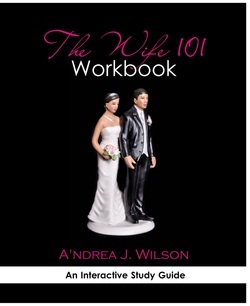 This study guide by Author and Marriage & Family Educator, Dr. A’ndrea J. Wilson, takes readers beyond the novel and into the actual Wife 101 course. Take a deeper look inside the 31 lessons of the book, the 31 verses of Proverbs 31, and the 13 classes that make Wife 101 an unforgettable novel. Follow along as Amber and her classmates are challenged to become better women, wives, and mothers. Get a richer understanding of your role as a woman and how the Word of God directs women to think and behave. Use The Wife 101 Workbook as a part of your women’s group, book club, or in your personal quiet time.